We provide a full range of standard and custom web hosting solutions. 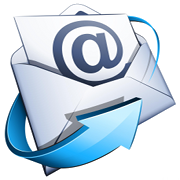 Providing high speed, email hosting solutions with actual service. Sometimes you just need a quality, fast and reliable email hosting solution without a website. We do not place any limits on the size of each email (please note that if you choose to use your ISP’s outgoing mail server, they may apply limits). You are only limited by the amount of online storage space available to you. If you download your mail using a mail client like Mozilla Thunderbird or Microsoft Outlook (as well as most others), email can automatically be deleted from the server when it is downloaded. We utilise the very best data centres across Australia and abroad in Europe and the United States. All our email hosting services are run on top quality servers and you can trust that we will look after them day and night. After all, we know that the internet never sleeps. If you decide to add a website later, we can convert your email hosting service into a full web hosting service and ensuring there is no downtime. * Amounts quoted are in Australian Dollars (AUD) and inclusive of 10% GST.